The multimillion-dollar 911 call center a the Hamilton County, Indiana, sheriff's office has 24 state-of-the-art, computer-aided dispatch systems. 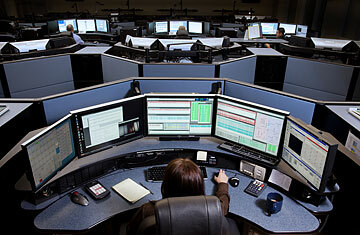 Each operator sits in a plumped-up chair at an ergonomically designed desk on which five large screens simultaneously show call status, caller information, police radio activity and other date  all of which can be shared instantly over radio, phone, Internet, dispatch and cellular systems. The phone rang at 4:43 a.m. on March 27, 2007. Patty Michaels, a dispatcher at a 911 call center in Belleville, Ill., picked up. On the other end, a woman screamed for help. She said her husband had attacked her. Michaels heard a baby crying in the background. The caller's address appeared on Michaels' screen: it was in O'Fallon, Ill., less than 10 miles away. Michaels asked the woman to confirm it. "That's when it got really tricky," she says. The caller wasn't in Illinois. She was in South Korea. Two days earlier, the woman and her baby had left O'Fallon to join her husband, an Army serviceman posted in Seoul. She was locked in her bedroom, afraid for her life. But because the woman had dialed 911 from a VOIP  voice over Internet protocol  service, using a computer, Michaels had no way of finding her. The 911 system doesn't locate computers; it shows only the address that the phone service is registered to, and when Michaels' caller left the country, she didn't update her address. That small lapse underlies the fundamental problem of 911: it was developed for landlines back in the days when copper wires ran between a telephone and a central switch. But since 1968, when the first 911 call, a ceremonial test case, rang in Haleyville, Ala., the service has grown to cover 96% of the U.S. and now receives some 240 million calls a year  less than half from landlines in many communities. Americans assume we can connect to 911 in all the ways we connect to each other. Our GPS-enabled smart phone, Google and Foursquare may know exactly where we are at any given time, but unfortunately, these technologies aren't compatible with standard 911. Traditional emergency services don't take texts, photos, Skype calls or videos either. Then there are social media like Twitter and Facebook, which work when our phones don't. After the March 11 earthquake and tsunami in Japan, millions of people communicated through social networks when landlines went down and mobile networks were overwhelmed. Within an hour of the earthquake, more than 1,200 tweets a minute were coming from Tokyo, including video updates on the scene. But a system like 911  the first first responder  is out of the loop. Such gaps leave us with a patchy emergency infrastructure that has become progressively less able to find people in need. After dispatcher Michaels accepted that the call coming from South Korea was no joke, she was stumped. She couldn't use GPS or subscriber information, and she couldn't access the local telephone carrier for help. Michaels could hear the woman's husband shouting from another room. "I was so afraid we'd be disconnected," she says. "Then we would never find her." It took 20 years from that first test call in 1968 for 911 to reach 50% of the U.S. population. In the beginning, dispatchers couldn't even tell where calls were coming from. Eventually, a set of fixes allowed a caller's phone number to be passed to the 911 center, where it was matched to a street address in the local telephone carrier's database. The upgrade meant that landlines excelled at caller location. Then phones went mobile. As cell phones proliferated, old problems resurfaced  except worse. Because the location of cell phones shifts constantly, the "local" 911 call center may change for each call from a given phone. Typically, a call can be routed based on the location of the tower handling it. But depending on cellular traffic, that tower may not be the one physically nearest the caller. Recent solutions include using several towers to triangulate the source of a signal or homing in on the phone's GPS. But some call centers still don't have cellular-call location today, and even the best fixes aren't perfect: it's impossible to triangulate off a straight line of towers in rural America. As for GPS, it presents longitude and latitude, but 911 centers have no way of getting altitude, so they can't automatically find a caller in a high-rise. See the top 10 non-emergency 911 calls.